Why the Republican Party attracts provocateurs, faux martyrs, and grifters in droves. 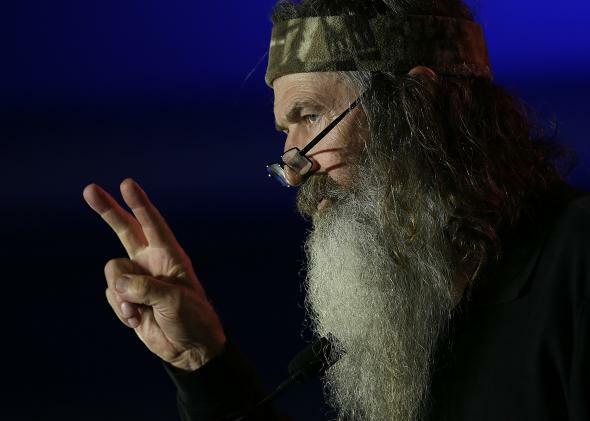 Reality TV personality Phil Robertson speaks during the 2014 Republican Leadership Conference on May 29, 2014, in New Orleans. Every political movement has its opportunists, and there’s no doubt the Democratic Party has its share of grifters. But MSNBC doesn’t devote its commercial programming to selling gold, and failed Democrats aren’t running for president to drive their book sales. Simply put, there’s a huge market for grift on the right, and—aside from the ethics of it all—it’s a huge problem for the GOP. Like with Bill Clinton in 1992, the election of Barack Obama in 2008 turned a lot of conservatives into easy marks for the worst provocateurs, who made millions with wild rumors and apocalyptic predictions. In turn, there’s a generation of Republican politicians who aren’t as interested in policy as they are in building clips for a gig on Fox News. As we saw with the GOP presidential primaries, it’s impossible to keep this from the general public. Eventually, mainstream Republicans will have to affirm extreme ideas (i.e., “self-deportation”) to pass muster with the conservative base, and in the process, hurt themselves with ordinary voters. If Republicans want to avoid this for the next election cycle, they should ignore the Cains and D’Souzas of American politics. After all, the only thing worse than listening to grifters is encouraging them.